Bobbi Misiti FMCHC, is known for her enthusiasm and love of health through good local organic whole foods, herbs and oils, yoga, breathing and movement, and permaculture gardening. 1984-1990 Purchasing Manager, Flight Systems Inc. While I loved setting up Just in Time programs and optimizing stock components, it was in this job I discovered I did not enjoy spending 40+ hours each week under fluorescent lights, breathing corporate building air, and sitting in the office environment. 1990 – 2001 Self-Employed Personal Trainer, Health & Lifestyle Management Consultant, and Exercise/Movement Teacher. I have been working independently since 1990 teaching the world about the power of breath, movement, food, herbs, and oils. My journey on this path began in 1990 as a self employed personal trainer, fitness instructor, and nutrition educator teaching in recreation centers, community centers, gyms, and various rented spaces all over Central PA. In 1996 I found the practice of Yoga and delved deep into the yoga path following a soft method of old fashioned Ashtanga Yoga. Over the past 20+ years I have been studying, practicing, and teaching the ancient philosophies of yoga, breathing, meditation, and Ayurveda world wide. From April of 2001 – January 2017 I owned and operated a full on yoga studio; BeFit Body & Mind YOGA, taking a giant leap on my own to teach from my heart – influencing people with lifestyle medicine — teaching the importance of lifestyle as a means to prevent diseases — and thrive. 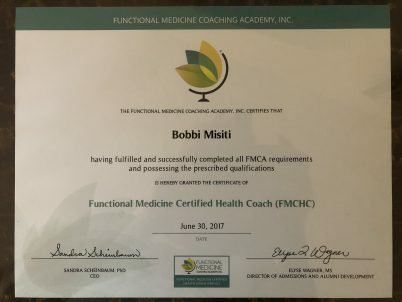 I graduated from the Functional Medicine Coaching Academy, in June 2017 as a Certified Functional Medicine Health Coach, FMCHC. In December of 2016 during the practical training of our certification I started accepting Health Coaching clients both in person and online, slowly evolving my business toward Health Coaching. As my health coaching business grew I designed and developed a tool on my website called Learn & Thrive to use with my clients. This wonderful section has information to support a healthy lifestyle; de-stressing techniques, seasonal recipes and cooking tips, planning and meal planning, ways to avoid chemical exposures, and a blog. I have personally and with my family used herbal remedies, teas, and essential oils since the mid-80s. With more research than ever before on the benefits of herbs and oils I have happily added Aromatherapy services to my offerings including therapeutic uses of herbs and oils to help with issues such as sleep, stress, illness, to support other medical interventions or help to reduce side effects, and to reduce overall chemical burden through making homemade chemical free toiletries, lotions, and cleaning products. I have an extensive background in anatomy, kinesiology, nutrition, yoga practices, herbal home remedies, and fitness training. I currently reside in Maui, HI when not teaching in PA or around the world. I have three grown wonderful children and three lovely grand daughters. From 1990 to present I have attended hundreds of workshops and seminars around the world on improving my understanding of the body and how it works, while developing my skills as a teacher and educator. I have also logged countless hours studying from Functional Medicine doctors through their lectures, summits, articles, and workshops.